It’s been a busy start to 2018. Apart from preparing a new small business course in Johannesburg with our South African partners, Trueline Leadership Consulting, as you can see, we have completely redesigned the ACG website, organising almost ten years of articles, case studies and blogposts into categories and tags. In the process, we have realised how much of this content is still relevant and are preparing to put the best lessons and analysis into a new book. The main reason for the redesign was to allow you better access to the archives, which have been available only though a site search on the old website. After experimenting with a full-blown membership concept, we eventually decided on a magazine-style approach which highlights what we do best online: producing high-quality analysis on corporate governance developments and drawing out lessons on how to deal with and avoid the sort of regular scandals and failures that occur. This does, of course, take time, and to allow us to continue to produce this content – and indeed increase the frequency of our updates, we were considering limiting access to this archive to paying members. 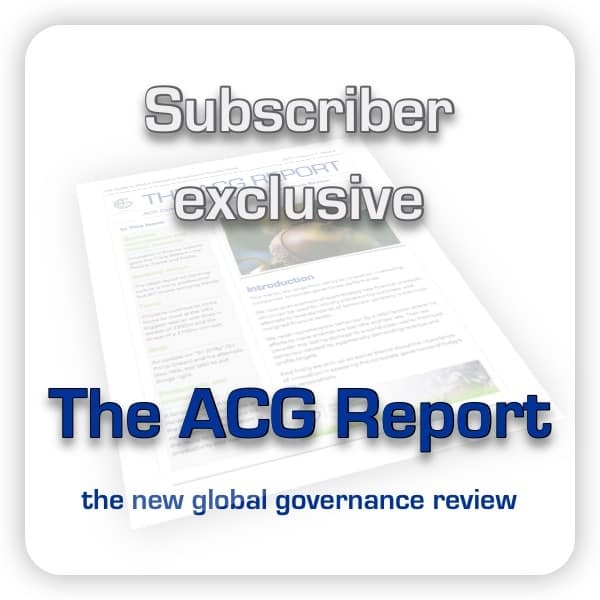 In the end, we have decided to keep access open to registered, free, members and instead develop The ACG Report and ACG Watch (an increasingly rich reference resource) as our premium subscription. We want to make sure you, as a subscriber to our mailing list, have access to all this content, so simply click here to create a free ACG Membership Account, which will give you unrestricted access to every article and regular case study we have published over the last 9 years (note, this does not include the full Enron Case Study and others we sell on the site). To celebrate the launch of the new site, we are offering half price Training Membership for our subscribers, with permanent access to our Applied Corporate Governance eManual, 6 ebooks with our full methodology for implementing good governance in your organisation. We will also throw in the full Enron Case Study, with the proprietary Governance Survey Tool for you to see the methodology in action and test different assumptions. If you join as a Training Member, you will also be entitled to a 50% discount on a year’s subscription to the new ACG Report and ACG Watch. ACG Watch will be an online database and reference library of all the organisations featured on the website (not just in The ACG Report), currently containing over 50 organisations. Keep checking your email for updates for more information. BUT WAIT! YOU SAID FREE! I did indeed. I don’t know about you, but I feel a little disappointed when someone offers something free then tells you that you have to buy something to get it for free! While we are a business and not a charity, we do want to give as much value as possible. So free means free – but we do ask for a small favour in return, which is actually a favour to yourself. To help us serve you better and create products and services you value, please tell us what you most need help with. For example, do you need company research/analysis? Help with stakeholder engagement? Study guides? A speaker for your event (or help organising one)? Giving us this information will also help us tailor our emails to you better as they will be better targeted to your needs. We will be updating our email preferences to reflect your feedback. The first 10 (ten) respondents will receive a free copy of our eManual course. Everyone who responds will receive a coupon for 50%, valid after the initial promotion above has finished. Do you have any other comments, suggestions or questions on the website, training material, emails or other aspects of the ACG website and training offered?